How best do little kids learn? It’s not a question generally asked by only slightly bigger kids! A. is an unusual student (aren’t they all?) in Grade 2 with a passion for teaching and learning. His teacher understands him well and, rather than demanding compliance (not his forte), has tapped into his interests, encouraging him to explore possibilities by going down to teach the Prep children. Apparently he meets with the Prep teacher to understand their needs and discusses with his teacher his ideas for his lessons. When Kath Murdoch visited the school, his teacher introduced A. and got Kath to explain the notion of inquiry learning. She’s working indirectly on helping him regulate his own learning through his understanding of learning in the bigger picture. ‘So… I need to get them curious’, he says, ‘and encourage them to be risk takers and try different things. They need to work together and talk to each other. And I need to make sure it is challenging… slightly bigger than where they start so they have to be extended and keep going…’. He pauses for a moment ‘And if not, it’s giving me a clue that the lesson might not be suitable or interesting’. As A. starts copying from the cards, I tell him he can have the one he’s focusing on. He looks longingly at the rest of the pile and I encourage him to take them all. ‘They might help me further along’ he says and heads happily back to class, notebook in one hand, learning principles in the other… on a mission to explore how kids learn best. Just give kids the opportunity and encouragement… and magic happens. Over the last week, my team of Year 5 teachers, together with Edna, have been planning a unit of inquiry into energy. We had already established the rubric for conceptual understandings that was to guide our inquiry but were looking for ways to allow for more creativity. The opportunity arose in my class when, after an initial provocation and some personal research into energy, a student declared that he would like to create something electronic. This caused a flurry of excitement as other students started contributing their ideas about things that they would like to create. They realised that in order to make their inventions they would have to research the scientific principles behind them. They wondered whether their inventions would be helpful or harmful to the environment. In order to find the required information, the children felt that the internet was the obvious first source. As we had recently inquired into digital citizenship, it was heartening when a student reminded us that we would have to check for authenticity. Some students felt that we still needed people to help clarify information and assist us in the process of creation. After brainstorming a variety of people ranging from parents and grandparents to scientific experts, I smiled internally when I saw that my name was not on the list. Was it because they thought that I was hopeless at science or has owning their own iPads enabled them to take more control over their own learning, increasingly leaving me in the role of facilitator? Not all students were so excited about this idea and felt that it was ‘hard’ to create something and they were afraid of failing. After much discussion they decided that they would have to be risk-takers and show commitment if they were to embark on this process. I am now ready to introduce the central idea, ‘Humans use their understanding of scientific principles to create a more sustainable world’ and I’m really look forward to seeing what will evolve. What do parents think of student centred learning? 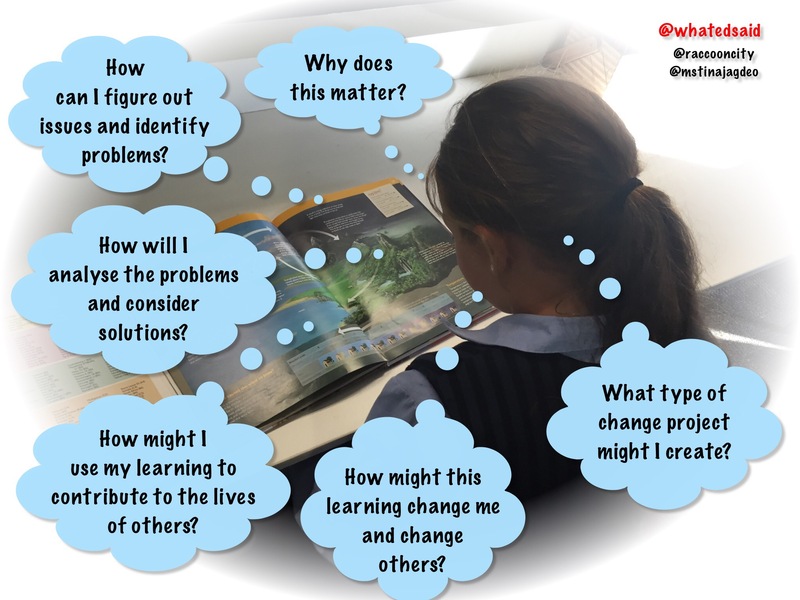 Educators at my school have worked hard during the past few years at deepening our understanding of inquiry learning, developing learner-centred practices, encouraging our learners to take ownership of their learning and building communities of learners which include the teachers as much as students. 1) creates a blurred line between those who are supposed to be in positions of authority (teachers, parents etc..) and those who are not (students); and has taught my children to have a voice without teaching them that it is not always appropriate to have a voice and that sometimes their views are not being sought. Why would this parent send their children to a PYP school? What do the children say at home to give parents this impression? Have we failed to help some of our parents understand our beliefs about learning? How do we educate parents whose vision of learning is based on when they went to school themselves? “It’s not about making learning happen, it’s about letting it happen”… This is the crux of Sugata Mitra’s message, whether he is talking about minimally invasive education, self organised learning environments or the School in the Cloud. It’s very different from traditional approaches to education, but not so far removed from the student centred, inquiry driven learning that takes place at my school. My colleague Jocelyn, with the task of teaching her spelling group Latin and Greek derivations, decides to let go even more than usual and use the SOLE approach. You don’t need a teacher to teach you If you want to learn. It’s like a process – we learn from each other just like the kids in India at the hole in the wall. If we do our own exploration, we will learn more skills. If we find out and understand for ourselves where spelling comes from, we are more likely to learn it and remember. We can choose what we want to learn and we learn more when we are passionate about it. When you set your mind to something you can do it. Sometimes we just need someone to look over and tell us we are good. You need curiosity to learn. Kids learn by themselves. If they have an interest they will learn. Learn how kids want to learn and they will learn. In the next lesson, Joc introduces the ‘big question’ – How have other languages influenced English words? She explains that in self organised learning environments, learners are free to choose their own groups and to move freely between groups. They will need to present their learning to others in an engaging way at the end. And then… she lets the learning happen! Marty forms a group of six and suggests they go through each step of the information process -define, locate, select, organise, present. By the end of the lesson, they have broken the big questions down into three inquiry questions and begun to explore. They will consider many ways to present but only choose later, so that they will be able to see the mode of presentation that suits best. Raf’s group realises they need some background knowledge as they only know a little about Greek and Latin roots. They immediately start researching and are very excited to find out that the English language has developed over time from so many different sources. They are intrigued to discover the extent to which wars have influenced the language. Each of the groups decides how they want to approach the learning and every group is different. 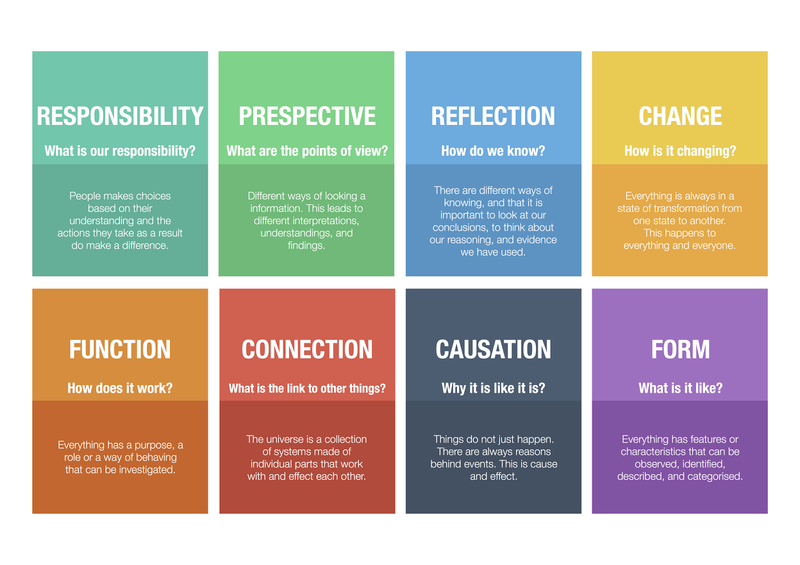 How would you define inquiry learning? What are the characteristics? Can you give examples and non-examples? Are the responses below similar or different to yours? Our Learning Team Leaders are revisiting inquiry in this month’s meetings. We organise our thinking individually first, using the Frayer Model, before discussing our ideas as a group. Despite the fact that we work, learn and plan together, everyone responds in different ways and the perspectives are interesting. Next, we view the beautiful video ‘The Potter’ (again!) and reflect on the ideas it portrays. It’s important to have opportunities to try and fail. You need to understand the principles before applying them to make the magic. Learning is enhanced by persistence, enthusiasm and resilience. The teacher’s role is sometimes to guide and inspire, rather than instruct. Teachers need to know when to let go and when to step in. Creating a safe, secure environment supports the learning process. Empower the learners to own their own learning. The teachers role is to support the learner in finding his own way. It’s not always necessary to teach skills first. Allow the learner time to experiment before the teacher steps in. Follow up – We’ll each read a blog post related to inquiry and unpack the big ideas at our next meeting. Inquire Within will probably be sufficient inspiration, but would you like to share your favourite post about inquiry? Planning is not coming up with a range of activities or developing a series of lesson plans. It’s a time to consider the rationale behind the unit and discuss conceptual ideas. A time to create a range of possible provocations which engage learners in the big ideas. A time to plan opportunities in which authentic student-directed learning can occur. The direction we’d like the unit to take – Setting the tone for the year, building a learning community conducive to learning. Citizenship: Being part of a group carries with it a sense of belonging or identity which includes rights and responsibilities, duties and privileges. These are guided by the agreed values and mutual obligations required for active participation in the group. Brainstorm the big ideas – respect, diversity, belonging, co-existence, contribution, community, relationships, interactions, culture, rights, citizenship, values, cooperation. A community is made up of people who have common purpose or shared values. Diversity within a community enriches the community. Being part of a community comes with rights and responsibilities, duties and privileges. Write the central idea – This needs to be a broad conceptual understanding, globally significant, relevant and engaging, which invites inquiry. We take some quiet time to write it individually, then discuss, adjust and adapt until we have consensus. Central idea – Communities are enriched by the contributions of individuals and groups. Our desired conceptual understandings are achievable and worthwhile. The unit will help build a community of learners to set the tone for the entire year’s learning. It will help cement the relationships between two groups of learners coming together for the first time from different campuses of our school and create an awareness that each group brings something to the whole. It will expose learners to the necessary focus of the Australian curriculum to support the development of their knowledge and understandings, without teachers resorting to mere ‘covering’ of facts. It will foster the passions, interests and talents of individuals and raise awareness of the fact that they each have something valuable to contribute. 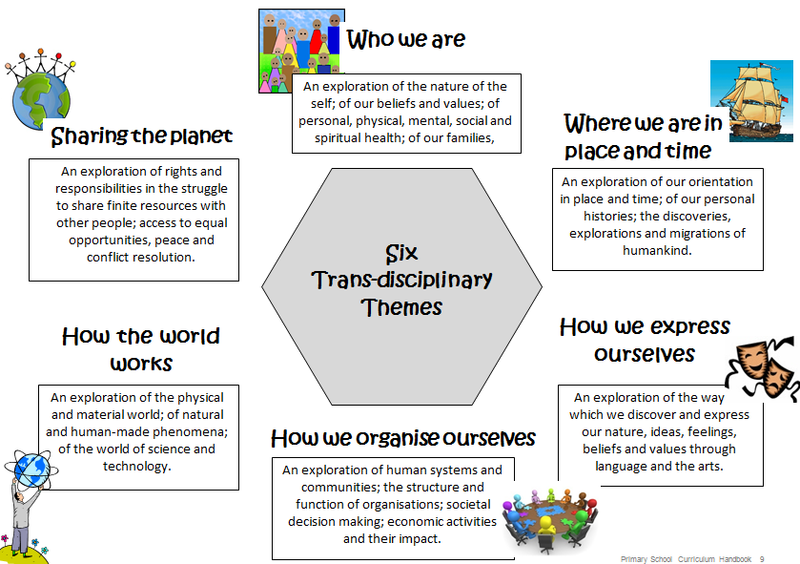 There will be opportunities to develop a huge range of trans-disciplinary skills and attitudes, and promote creativity, collaboration and critical thinking.